Today, I continue what I started last week and post another delicious Thanksgiving side item. 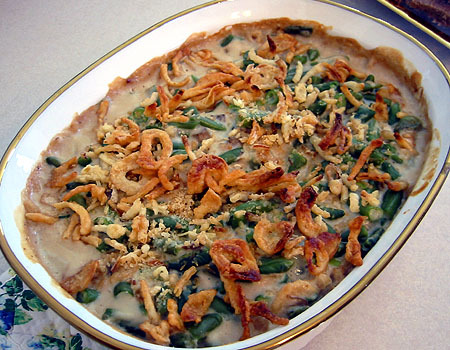 So, we all love the age-old Thanksgiving classic, Green Bean Casserole topped with French's Fried Onions, but a few years ago our dear friends made this recipe which totally blew all other green bean casseroles out of the water. It's "way better" than the recipe on the French's Fried Onions can. I promise! 1) Preheat oven to 350 degrees F. Combine the green beans, soup, buttermilk, pepper, and Parmesan cheese in an oven-safe casserole dish. Stir to mix well. 2) Sprinkle the top with French's Fried Onions and an extra dash of grated Parmesan cheese. 3) Bake for 45 minutes. Serve warm. That was super easy! This dish adds a nice dash of green to a spread of Thanksgiving foods that tend to look all yellow and brown - i.e. turkey, stuffing, mashed potatoes, gravy, creamed corn, yams, etc. Just add some beautiful red cranberry sauce to the table, and you've got it made. I'd encourage you to double this recipe if you have more than 2-4 people eating dinner with you - it gets inhaled. Enjoy!